So far in “A Prairie HomeKit Companion,” I’ve focused on HomeKit hardware that does things, like smart outlets and smart bulbs. But that’s not the entire HomeKit hardware story. 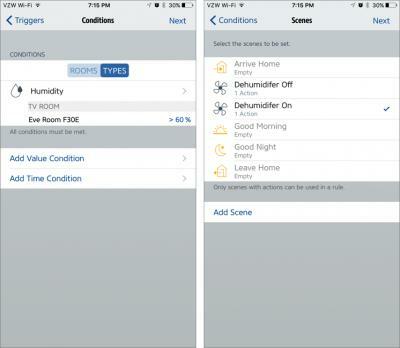 HomeKit also supports sensors that can monitor your home and either report data or use it to trigger actions. 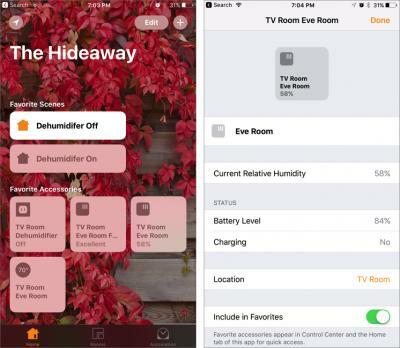 Perhaps the best-known HomeKit sensor is the Elgato Eve Room, which monitors temperature, relative humidity, and air quality. It’s a small box, powered by three AAA batteries, and it costs $79.95. Because the Eve Room is small and battery-powered, it’s unobtrusive and easily moved between rooms. In my experience, the batteries last about three months before needing to be changed, but you may want to consider rechargeable batteries. Apple’s Home app presents the Eve Room as three separate Accessories, one for each of temperature, relative humidity, and air quality. The Home app displays the Eve Room’s temperature data in degrees (Celsius or Fahrenheit), humidity as a percentage of water vapor in the air, and air quality as a verbal rating from Poor to Excellent (more on that shortly). 3D Touch or long press an Accessory and tap Details for more detail, including Eve Room remaining battery life. 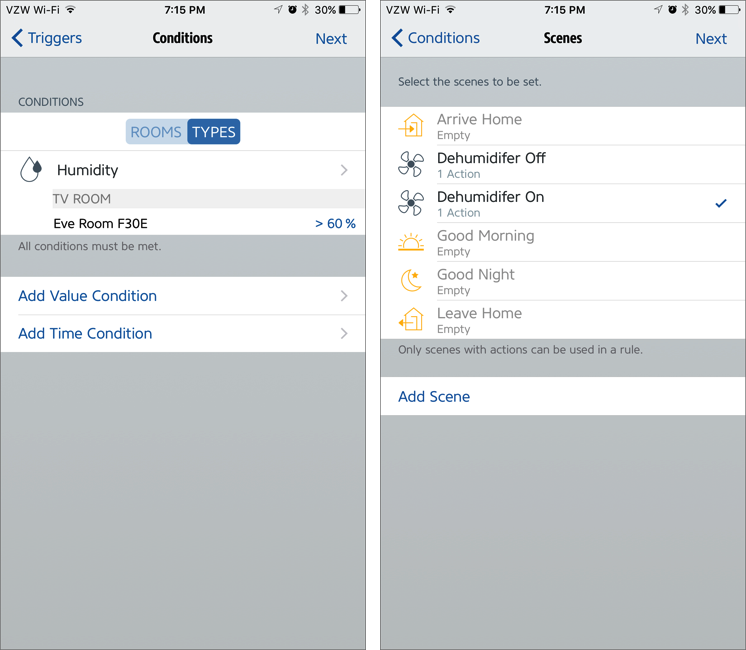 If you want to view the exact ppm measurement, you’ll need Matthias Hochgatterer’s Home app, which I reviewed in “A Prairie HomeKit Companion: Fine Tuning with the Other “Home” App” (21 February 2017). Unfortunately, Apple’s Home app can’t take full advantage of the Eve Room, but you don’t need to buy Hochgatterer’s Home app to do so. 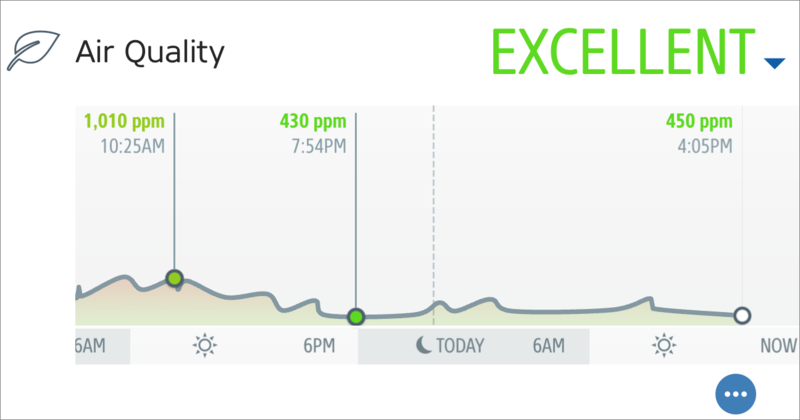 The Elgato Eve app for iOS offers more information, like graphs of air quality over time, in addition to being a full-featured HomeKit control app. I usually prefer sticking to Apple’s Home app for most things, but if you want to set up Automations that rely on the Eve Room, you need the Eve app. I’ll warn you that the HomeKit terminology in this article will come thick and fast, so make sure you’re caught up on the other articles in this series before proceeding. 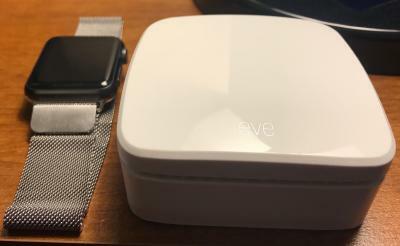 Eve Room Plus Eve Energy — I’ve had a review unit of the Eve Room for a few months now, but I didn’t have a real-world use at first. I saw the potential: if your air quality drops below a certain threshold, you could have HomeKit activate a smart outlet that turns on an air purifier. But it wasn’t until I moved to a house with a below-grade room that the Eve Room clicked for me. We have to run a dehumidifier down there to prevent mold and mildew, but the dehumidifier is loud, which is particularly annoying given that we watch TV in that room. Although I can adjust the humidity level on the dehumidifier, that setting controls only the compressor; the fan runs continuously. This is where the Eve Room paired with a smart outlet like the Elgato Eve Energy can come in handy (see “A Prairie HomeKit Companion: Two Smart Outlets,” 1 May 2017). As I noted, Apple’s Home app can only display data from the Eve Room, not trigger actions based on that data, so I turned to Elgato’s Eve app. Go to the Scenes tab, tap Edit, and then Add Scene. In the Scene, tap Add Actions, and enable the Accessories you wish to control. You can filter them by room or type of Accessory. Choose the actions for the Accessories. In the case of the Eve Energy smart outlet, that’s simply On or Off. Tap Done, then tap Next, name the Scene, and choose an icon. I created two Scenes: Dehumidifier Off and Dehumidifier On. Each one acts upon the Eve Energy in my TV room, which I’ve named Dehumidifier. 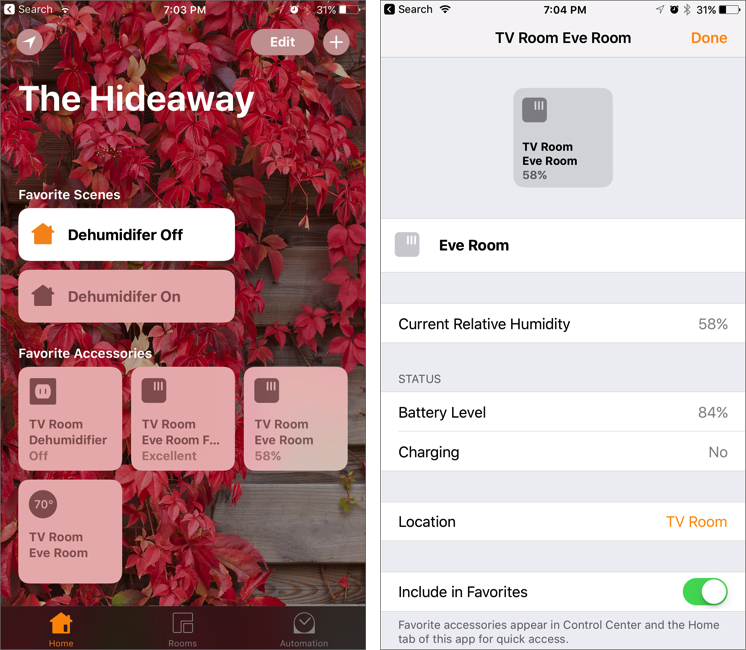 Remember that you could instead create the Scenes in Apple’s Home app (see “A Prairie HomeKit Companion: Controlling Accessories,” 16 January 2017), since it and the Eve app work from the same HomeKit data. Just return to the Eve app when it’s time to create the rule, as outlined next. 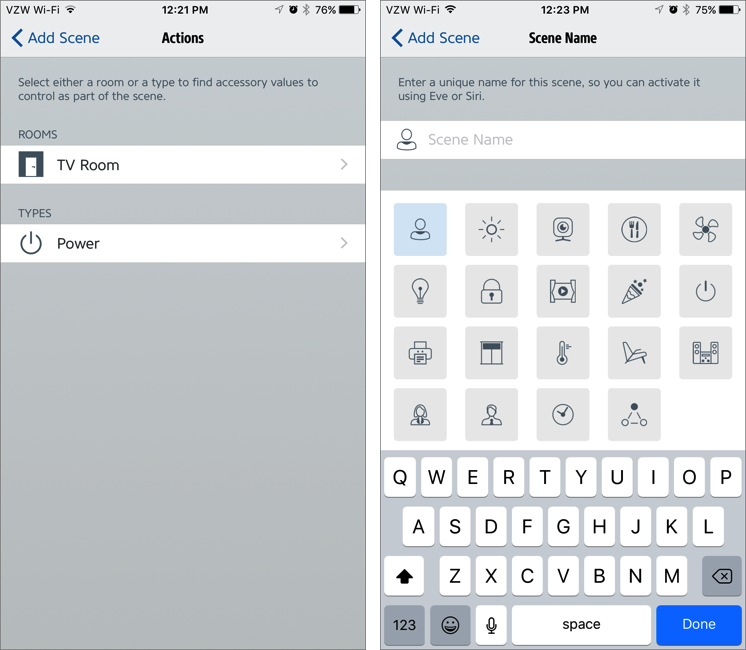 Make Rules in Eve — With your Scenes established, from the Scenes tab, tap the Rules sub-tab. This view lists your existing rules (if you have any) and lets you create new ones. After tapping Add Rule and moving past the instruction screen, you get to the Trigger screen. Choose either a Value Trigger or a Location Trigger. Since I want to control my dehumidifier based on the value of the humidity in the room, I chose Value Trigger. 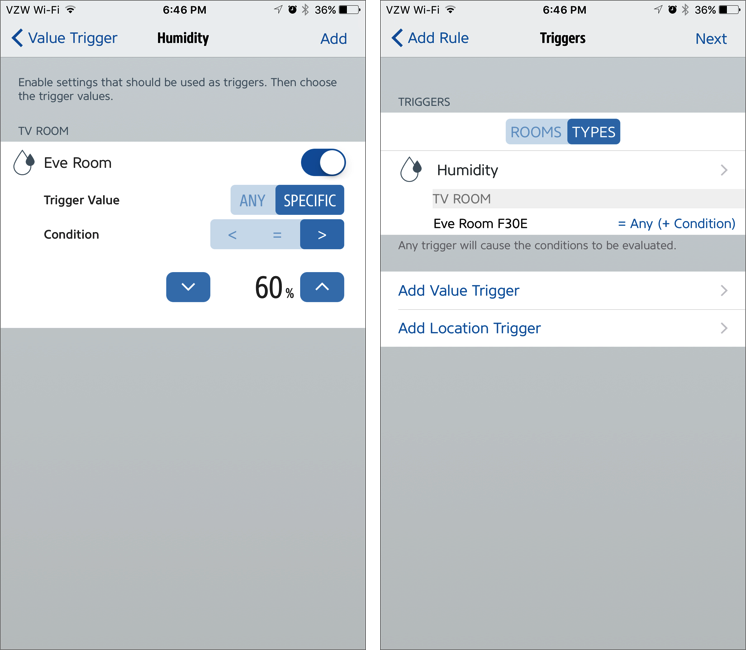 In the Value Trigger screen, you need to pick a triggering Accessory, either by room or type. Remember, the Eve Room appears as three Accessories, so I chose Humidity. At the Humidity screen, I flipped the Eve Room switch on and selected Specific. 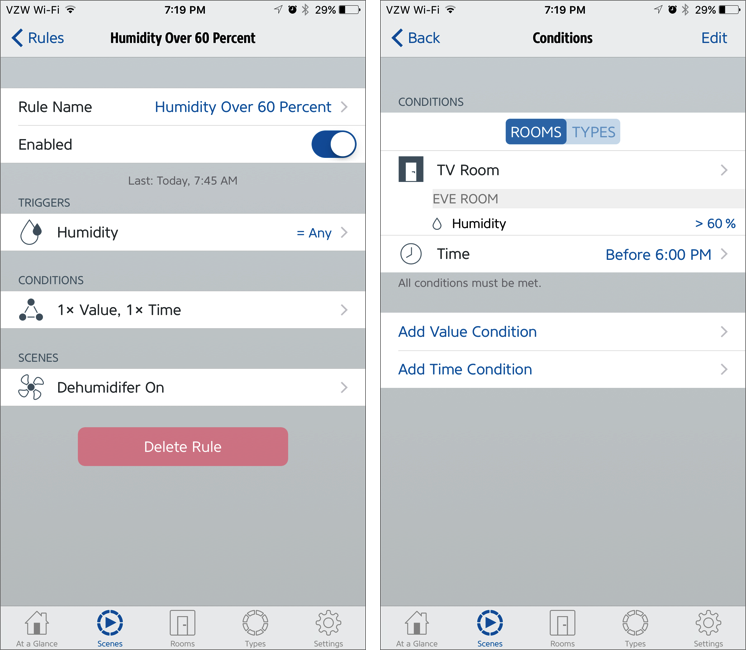 For the condition, you choose a humidity level and whether it triggers when greater than, less than, or equal to the value. Next comes the Triggers screen. Your trigger shows up near the top, under Triggers. You can tap the arrow on the right to see and edit the trigger, but I tapped Next to move on to the Conditions page. Although it was set previously, you can edit the humidity percentage here. Tap Next to move on to the Scenes page, where you choose the Scene you want to activate when the Trigger occurs. Finish up by naming the rule. To view your rules, go to the Scenes tab and then the Rules sub-tab. Tap one to see its details. When you do so, you may be a little perplexed. For instance, in the “Humidity Below 50 Percent” rule, I have the trigger as Humidity, the condition as Humidity less than 50 percent, and the Scene set to Dehumidifier Off. 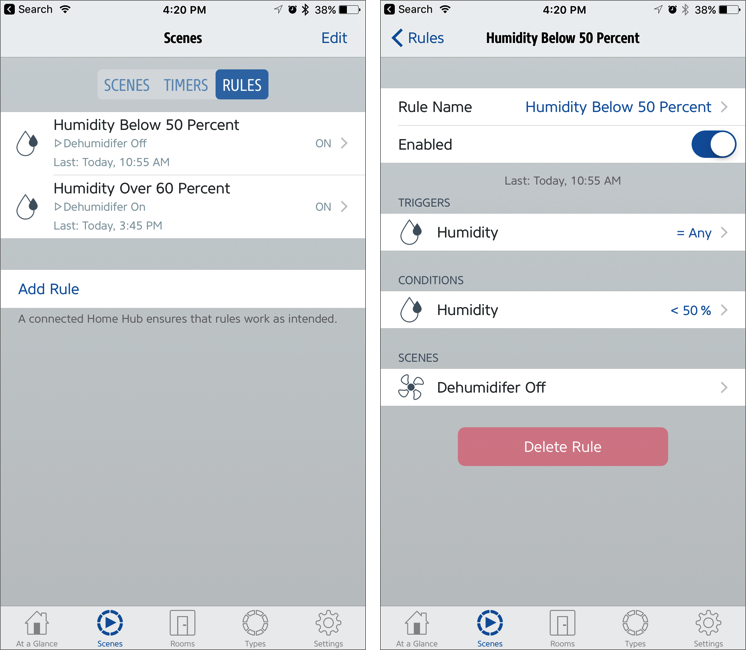 In plain English, these settings trigger the rule whenever the humidity changes, and if the Eve Room detects that the humidity is less than 50 percent, they turn off the dehumidifier. What if you want multiple conditions? Eve allows that. Tap any condition and you can add another Value or Time condition, which can be useful, as I’ll explain shortly. Here’s a HomeKit oddity: even though you cannot set up these rules in Apple’s Home app, you can view them under the Automation tab, and even enable and disable them from there. You can even adjust the activated Scenes and Accessories, but only some of the other settings. That’s because Home is reading in that HomeKit data, but can’t interact with all of it. 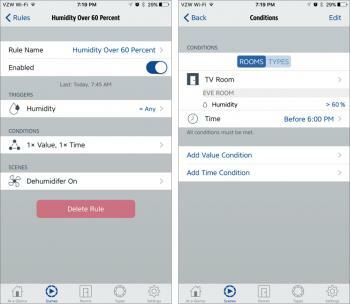 In essence, Apple’s Home app doesn’t support everything Apple’s own HomeKit framework can do. Figuring Out Your Rules — Creating rules in the Eve app isn’t that hard, but more difficult is figuring out which rules to make. As I’ve noted several times throughout this series, the tricky part of home automation is thinking everything through to create automations that make sense for you. My first thought was to set up a rule that turns the dehumidifier on at 60 percent humidity and off again when it drops to 50 percent. But that rule turned out to be a harsh mistress. If the dehumidifier kicked on while we were watching TV, I couldn’t shut it off! Well, I could, briefly, but it would kick back on as soon as the humidity changed again. As an aside, there’s some debate about what a healthy humidity level is in a home. The U.S. Environmental Protection Agency recommends 30 to 50 percent, but many experts recommend somewhere around 50 percent while keeping the humidity under 70 percent to prevent mold and mildew growth. I have dry sinuses and have to empty the dehumidifier bucket enough already, so I set it to 50 to 60 percent. So I had to rethink my approach. 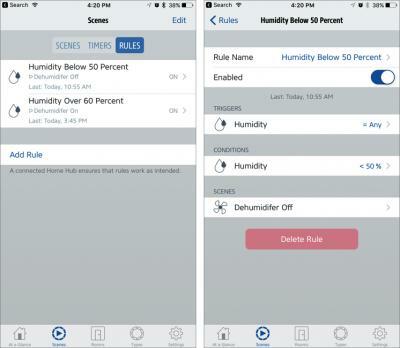 I ended up with two rules: one that turns the dehumidifier off when the relative humidity drops under 50 percent and another that turns the humidifier on when humidity rises over 60 percent, but only when it’s before 6 PM. That way, it doesn’t kick on during our prime viewing TV hours. To ensure that the dehumidifier runs after we’re done watching TV, I also set up a rule to turn the dehumidifier on at 3 AM, regardless of humidity. No one will be watching TV then. Setting up a timed rule in the Eve app is a little odd — you do that in Scenes > Timers. I prefer creating timed Automations in the Home app, as I described in “A Prairie HomeKit Companion: Automating Your Home” (10 February 2017). These rules could probably use a bit more tweaking, but that’s something I plan to iron out over time as we become more familiar with this new house. There may also be much better ways to do this. For instance, I could throw an Eve Motion motion detector into the mix to keep the dehumidifier off if someone’s in the room. But that’s a project for another time. In any case, don’t be afraid to experiment! Fine-tuning automations is part of the fun, and Rome wasn’t built in a day. Just don’t create more than you and your housemates can manage. Enter the VMUG Photo Contest to win a $50 gift certificate to Lens and Shutter. Click HERE for information about advertising. Click HERE for Apple Users Group Special Offers.